I am a new Linux system admin user. How do I use ip command line utility to display or configure networking, routing, and tunnels on Linux operating systems? How do I configures or displays network interface parameters for a network using TCP/IP on Linux operating systems? The ip command is used to assign an address to a network interface and/or configure network interface parameters on Linux operating systems. This command replaces old good and now deprecated ifconfig command on modern Linux distributions. 1. Find out which interfaces are configured on the system. 2. Query the status of a IP interface. 3. Configure the local loop-back, Ethernet and other IP interfaces. 4. Mark the interface as up or down. 5. Configure and modify default and static routing. 6. Set up tunnel over IP. 7. Show ARP or NDISC cache entry. 8. 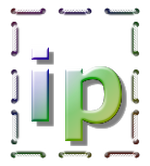 Assign, delete, set up IP address, routes, subnet and other IP information to IP interfaces. 9. List IP Addresses and property information. 10. Manage and display the state of all network. 11. 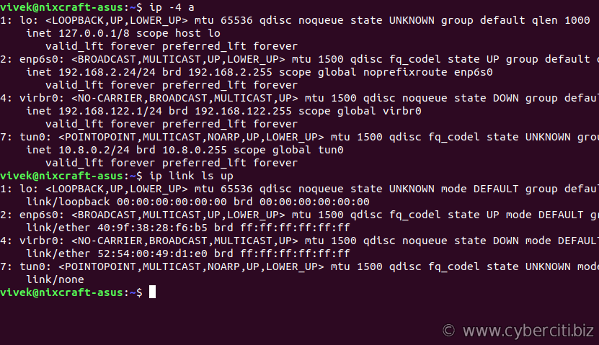 Gather multicast IP addresses info. 12. Show neighbour objects i.e. ARP cache, invalidate ARP cache, add an entry to ARP cache and more. 13. Set or delete routing entry. 14. Find the route an address (say 8.8.8.8 or 192.168.2.24) will take. 15. Modify the status of interface. Use this command to display and configure the network parameters for host interfaces. addr Protocol (IP or IPv6) address on a device. addrlabel addrl Label configuration for protocol address selection. neigh ARP or NDISC cache entry. route r Routing table entry. rule ru Rule in routing policy database. mroute mr Multicast routing cache entry. tunnel t Tunnel over IP. xfrm x Framework for IPsec protocol. Warning: The commands described below must be executed with care. If you make a mistake, you will loos connectivity to the server. You must take special care while working over the ssh based remote session. Donât be intimidated by ip command syntax. Let us get started quickly with examples. ip -4 addr flush label "eth*"
How do I change the state of the device to UP or DOWN? How do I change the txqueuelen of the device? How do I change the MTU of the device? STALE â The neighbour is valid, but is probably already unreachable, so the kernel will try to check it at the first transmission. DELAY â A packet has been sent to the stale neighbour and the kernel is waiting for confirmation. REACHABLE â The neighbour is valid and apparently reachable. noarp The neighbour entry is valid. No attempts to validate this entry will be made but it can be removed when its lifetime expires. stale The neighbour entry is valid but suspicious. This option to ip neigh does not change the neighbour state if it was valid and the address is not changed by this command. reachable The neighbour entry is valid until the reachability timeout expires. The syntax to invalidate or delete an ARP entry for the neighbour 192.168.1.5 on the device eth1 is as follows. Use the following command to manage or manipulate the kernel routing table.